James Cooksey, left, leaves court after pleading not guilty to hazing charges on Monday, Nov. 13, 2017. 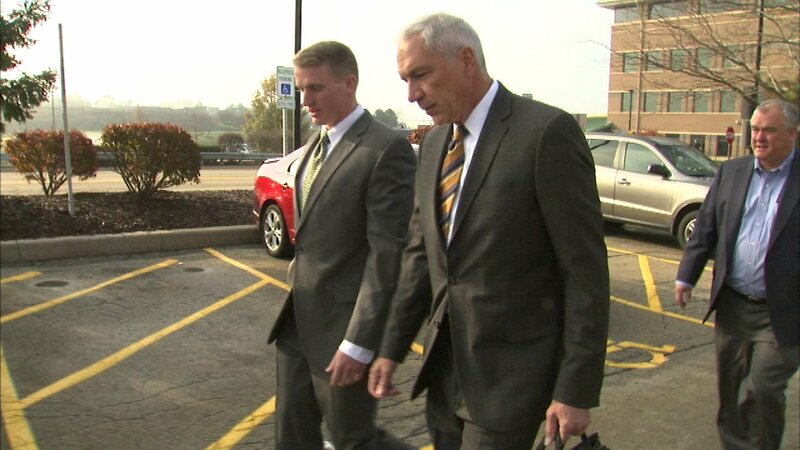 WHEATON, Ill. (WLS) -- The fifth Wheaton College football player accused of hazing pleaded not guilty to the charges Monday. James Cooksey and four others are accused of stripping and beating a former freshman teammate. He faces nine charges ranging from aggravated battery to unlawful restraint to mob action. Each count of aggravated battery carries a possible sentence of 2-5 years and $25,000 fine. Each count of unlawful restraint and mob action carries a possible sentence of 1-3 years and $25,000 fine. The charges stem from an accusation made by a former Wheaton College freshman, who told police the five football players dragged him against his will, restrained him with duct tape, beat him, stripped him down, tore both his shoulders and left him nearly naked on a baseball field. The other four football players pleaded not guilty in October.